Queen are one of the most famous and iconic stadium rock bands the world has ever seen. Originally fronted by the charismatic Freddie Mercury, they have produced anthems such as We Are The Champions and We Will Rock You along with the unmistakable Bohemian Rhapsody. Queen have recorded countless No. 1 albums and singles and their estimated worldwide sales are upwards of 200 million, making them among the biggest selling artists of all time. The original line-up of Freddie Mercury, Brian May, Roger Taylor and John Deacon formed in London in 1970. The band enjoyed success across the UK with albums Queen and Queen II, but they found international fame with the release of Sheer Heart Attack in 1974. While their first two albums were more traditional prog-rock or heavy metal in style, Sheer Heart Attack and its even more popular follow-up A Night At The Opera were much more versatile albums. The music was more experimental and more fun, striking a chord with fans everywhere. The monster hit Bohemian Rhapsody stayed at No. 1 in the UK charts for nine weeks and became a worldwide hit. From the late seventies to the late eighties, Queen continued to release acclaimed and successful albums such as News Of The World in 1977, Flash Gordon movie soundtrack in 1980, The Works in 1984 and A Kind Of Magic in 1986. Songs such as Killer Queen, Don't Stop Me Now, Crazy Little Thing Called Love and Under Pressure, with David Bowie, added to Queen's legacy of classic and hugely popular songs. Dubbed the greatest live rock act ever by many fans, Queen have had a host of famous concerts including a charity show at Wembley Stadium for Live Aid in 1985 and a series of sell-outs at the famous Madison Square Garden in New York. Mixing glam rock, heavy metal, pop anthems and operatic vocals, Queen offered a truly one-of-a-kind live experience that has thrilled millions of live fans across the globe. After the death of Freddie Mercury in 1991 the remaining band members re-released Bohemian Rhapsody in Freddie's memory and raised over one million pounds for charity while reaching No. 1 for an unprecedented fourth separate occasion in the UK. 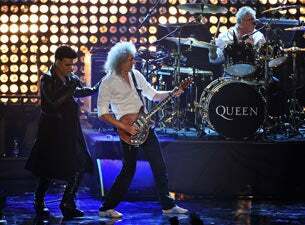 In more recent years, Brian May and Roger Taylor continue to keep the Queen experience alive, often working with Paul Rodgers and other guest front-men. Recent guest collaborations include working with the Foo Fighters in Las Vegas and with Jessie J at the Olympics Closing Ceremony.